Director James Wan shared a behind-the-scenes photo from Aquaman (2018). Wan took to Instagram to share what he called his favorite character design. "I'm gonna slowly put out some Aquaman pics from my personal collection," he said on Instagram. "What better one to start but with Black Manta (Yahya Abdul-Mateen ll). One of my fav character designs (from any of my work)." The photo looks like it's from the scene where Aquaman (Jason Momoa) and Mera (Amber Heard) fights David Cane aka Black Manta and the Atlantean warriors in Sicily. This is high praise. There are a ton of great costume and character designs from Aquaman. He also directed the horror film Saw (2004) and created the iconic "Billy the Puppet". The character design was an important part of the movie for Wan. 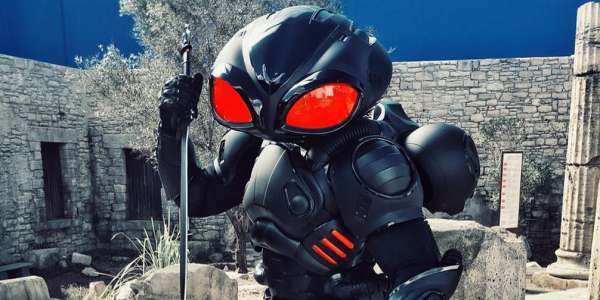 "I do not think I could have made this movie and not include Black Manta," James Wan said. "I think that fans would have rioted if I did not include Black Manta in there. But obviously knowing this movie, the main plot is about the throne of Atlantis, so that means the main antagonist would have to be King Orm. But I wanted to introduce Yahya's character before he becomes Black Manta and see how he becomes Black Manta." I was personally surprised how faithful the costume design was to the comic book. Black Manta has always been a powerful comic book character, and the movie honored him while still keeping it grounded in reality. They even came up with a plausible reason why he wore the big helmet. 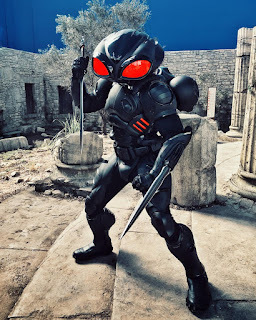 While they haven't started production on Aquaman 2 there's a lot of hope that Black Manta will return in some form to terrorize the hero and exact his revenge. Aquaman is now on home video from Amazon and other retailers. Official synopsis: "From Warner Bros. Pictures and director James Wan comes an action-packed adventure that spans the vast, visually breathtaking underwater world of the seven seas, "Aquaman," starring Jason Momoa in the title role. The film reveals the origin story of half-human, half-Atlantean Arthur Curry and takes him on the journey of his lifetime—one that will not only force him to face who he really is, but to discover if he is worthy of who he was born to be... a king." What do you think of the Black Manta character design? Let us know in the comments below!